This report summarises the key activities of OxVox, the Oxford United Supporters Trust, for the financial year 1st October 2016 to 30th September 2017. The report also covers activities the Trust has undertaken since the end of the financial year to date. 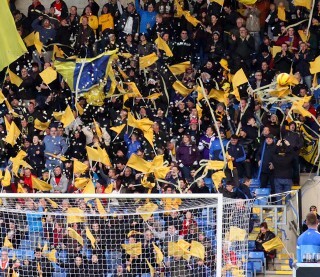 Focused activity, coupled with the ongoing aim of strengthening the Trust’s relationship with OUFC, the OxVox membership, the wider fan base and other stakeholders – including Firoz Kassam, the officers of Oxford City Council and other key influencers. Identify and deliver specific community projects that benefit fans, OUFC and the wider community. Continue to significantly grow membership numbers – to give the Trust a stronger, more representative and credible voice. Target 1000 for the year. Further develop our robust communication platforms – including, Twitter, Facebook & Web Site, and ensure regular/timely communication to members, including meeting notes and any ‘announcements’. Keep regular contact with all key stakeholders – Club, Councils, Stadium Owner, Community Group. Build trust, credibility and mutual respect. Meet regularly with the Board and senior officers of OUFC and continue to establish the position of a critical friend to the club, whilst taking an independent ‘fans first’ and community stance in all that we do. Develop a strong & enthusiastic Committee – creating a professional, open style, great teamwork and with high levels of confidentiality when required. Develop regular communication with other OUFC fans groups – agree synergies and understand each others key areas of focus and expertise. Collaborate where appropriate, but avoid any duplication of effort. Investigate the potential for a different stadium arrangement that would benefit OUFC and the wider community. Progress the opportunity for meaningful fan representation on the board of OUFC. Build to secure the future sustainability of Oxvox – member engagement, seek future committee members with identified key/relevant skills. In addition to the above, we agreed that always having a strong working relationship with the club’s owner, built around – regular communication, trust and mutual respect – would give OxVox the best opportunity to really understand and influence plans & decisions that might impact on the fans of OUFC. Significant work has taken place on our member data base and website with initiatives to speed up and achieve timely communication. This has included a switch to the MailChimp system. Although challenging at times, we’re pleased to confirm that all our systems are working well and are secure. In addition, Stewart Donald remained as a co-opted member and Terry Winter supported remotely as treasurer – although not a member of the committee. This year, at the AGM date, Jem Faulkner, Simon Bradbury, Graham Butler and Jemma Hayward have decided to step down. This has created 4 vacancies on the committee. Applications were sought and we are delighted to report that, Simon Hathaway, Wes Harrison, Dave Thornton and Paul Peros have stepped forward, and with no need for an election, will be duly appointed to the Board of OxVox. In addition, Stewart Donald has confirmed his willingness to remain as a co-opted member and Jemma Hayward has also put herself forward. It will be the task of the new committee at their inaugural meeting to confirm Co-opted members as well as electing a new chair, vice chair, secretary and treasurer. This meeting will take place within 4 weeks. With the above changes, the committee will revert to its full complement of 10 members. For information, membership growth over the last few years is detailed below. It was once again great to see a significant number of lapsed members, whose memberships had historically expired, deciding to re-join the Trust. We also note a significant growth in younger members. We now have nearly 30% of members who are under 30 years of age. Membership fees were kept at ‘£10 for 3 years’ – something that had been introduced 3 years ago, and the simple online PayPal mechanic continued to make joining the Trust an easy thing to do. In terms of overall membership, OxVox now sits in the top 15 Trusts in the country, where a membership fee is charged. This has enabled us to have more influence and involvement in national fan/football issues through our umbrella organisation – Supporters Direct. Working with Corporate Partners featured during the year and once again businesses such as T3D Design, Denton Builders and Isinglass Insurance continued to be wonderful supporters of the Trust. The drive to increase membership still further will continue, as will initiatives to encourage an increasing number of younger fans to get involved and join OxVox. Thank you to all members, new, old, and corporate, for supporting the Trust. A continued and concerted effort to engage with members and the broader fan base saw us also significantly increase and drive our social media presence. The Trust now has over 3,000 active followers on Twitter (up by more than 500 from last year!). The Trust now has a good Web Site, which is regularly updated with meeting notes and other news. The site holds an archive of committee meeting minutes. Yellows Forum continues to be an important means of communication and has been hugely helpful in engaging with members and the wider fan base. Committee minutes are sent to members from the 6 committee meetings that have been held over the past 12 months. The Trust has also held 2 open members meetings and managed to attract guest speakers such as Darryl Eales, Niall McWilliams, Dan Harris, Bob Price (leader of Oxford City Council) and Ian Hudspeth (leader of Oxfordshire Council). As previously stated, your committee took the conscious decision to focus on the priorities stated earlier in this report and this meant that ‘fund raising’ again did not feature during the year. This strategy has meant the Trust has predominately relied on income from membership fees and a small number of donations. Given the continued increase in membership and therefore ‘fees’, the Trust was able to deal with all of its obligations, invest in projects and create a surplus. The Trust’s income during the financial year was £3,835 with an expenditure £1,896, resulting in an operating surplus of £1,939. The committee are satisfied with the Trust’s financial performance and the annual accounts are now available for inspection by members. Cash at bank was £12,180 at the year end. Spend continues to be carefully managed and has been further reduced in areas such as, meeting costs and the preparation of accounts. Finances will continue to be tightly controlled this year. Any monies generated will only be used to support specific projects. The Trust were delighted to continue to sponsor the (highly successful!) Oxford Blackbird boy’s team – a sponsorship and relationship we plan to continue. The Trust also now sponsors the Kidlington Girls U13’s – who’ve had an excellent year! Following ongoing discussions with The Yellow Army, it has been agreed that YA would lead on fund raising activities & focus on events that directly benefit fans and/or improve the match day experience. There are likely however to be some joint activities/initiative in the coming year. We believe this plan is a sensible approach and allows the 2 organisations to focus on their respective areas of expertise and avoid any duplication of effort. We propose to continue the same approach again this year. Clearly a level of revenue generation is important and the Trust will be seeking to engage with additional corporate partners as well as further increasing membership to support the financial needs of the Trust. The Trust has continued to build strong working relationships with the club, albeit that relationship difficulties at the start of 2017 did prove problematic for a time. However it should be stressed that communication always continued during this period and relationships strengthened as the year went on. A significant number of ad hoc and specific calls/communications continually take place with a variety of senior people within the club. With new ownership now confirmed, OxVox have worked hard to establish open lines of communication with Tiger. Regular calls/emails and a couple of face to face meetings have taken place. We are confident that Tiger is very open to fan engagement and fan involvement and this has been demonstrated by various recent marketing initiatives as well as open dialogue on ticket pricing for next season and work with safe standing opportunities. (a) Safe standing. Work is continuing on solutions that can add atmosphere and improve fan safety. It’s hoped these initiatives can be realised in the not too distant future. (b) The Trust have continued working on building a robust relationship with Firoz Kassam with the ongoing aim of trying to find a more equitable stadium arrangement for OUFC. The clubs move into arbitration with FK has delayed progress, but work continues and the hope remains that a sensible and beneficial solution for OUFC will be found. (c) Strong relationships have been built with Oxford City Council, Oxfordshire County Council and Cherwell County Council in relation to stadium opportunities and other potential initiatives around the stadium. (d) Fan representation on the board of OUFC was pursued with Darryl Eales and supported by Supporters Direct representatives who met with DE and OxVox. This work has stalled, but remains an aim and is being discussed with Tiger. (e) Strong links have been established with community interest groups. (f) Stewart Donald remains as a co-opted member. (g) A regular and formal dialogue framework has been established with Thames Valley Police with the objective of airing fans’ concerns (and any compliments!). (h) The Trust lobbied hard (again) with other Trusts around the country regarding the new EFL Trophy format that saw the introduction of Premiership under 23 teams to the completion. This work will continue and the Trust will take instruction from members as the stance/action we should take with regard to next year’s competition. (i) The Community Right to Bid (CRTB) has been re-applied for. This is the country’s first ‘renewal’. We expect to hear news by the end of May. Following the formation of your new committee, we will consult with members as to the key priorities that members wish us to focus on over the next 12 months. EFL Trophy – what’s our stance? What, if any, action should we take? Car parking and traffic management at the stadium. Fans in the Boardroom. How might it work? Should we seek a shareholding? Stewarding and policing of matches. Community projects – ideas from members? Membership growth & corporate partners. Grow membership to 1,500 plus! Build the relationship with The Yellow Army and OUFC Community Trust – working together and deciding who does what. Much has been achieved, but, as ever, we still have lots to do! Increasing OxVox member participation in the Trust, with ideas and expertise, will help OxVox develop and become more effective, credible and representative. Ensuring a mutually beneficial and supportive working relationship with the club and its owner is vitally important, but our agreed position of being independent and a critical friend, with a fans first agenda, remains crucial and means that we are able, when necessary, to ask the more challenging questions. We’ll continue to work hard and listen to the views and any concerns of members and if required, will put those views directly to the club and any other relevant stakeholders. Your Supporters Trust will remain an independent voice and the stronger & more professional we can become, the more influential we can be in helping to shape the future for the benefit of OUFC, our amazing fans and the wider community.